There is another side to remote access. While screen sharing solutions are often considered a corporate tool that offers demonstrable business benefits, the technology is not just about enabling flexible working policies or cutting travel costs: it can also be used for the benefit of society. Remote access can be used to provide life-changing support to people with disabilities or chronic illnesses. This is particularly true in the education sector, where this technology can help students with Special Educational Needs and Disabilities (SEND) fulfill their academic potential. In this post we’ll examine some scenarios demonstrating how remote access can make a real difference to people with disabilities and chronic conditions, from the classroom to the office. The life of a pupil with special educational needs can be very challenging and full of hurdles. Parents don’t have it easy either, and can find themselves struggling to provide attentive childcare, as well as experiencing a host of other problems. In the long run, the constant feeling of “living life on hard mode” experienced by these families can take a considerable toll on their physical and mental health. Beyond the day-to-day struggle of keeping up with schoolwork, parents may be concerned about their child’s ability to make friends and connect with other kids, and worry that they might miss out on other learning and recreational activities. This can often be the case for visually impaired pupils in schools, for whom the classroom can be a daunting environment. While teachers may do their best to accommodate special needs by, for example, seating them close to the whiteboard, this often results in the pupil feeling frustrated and singled out. A remote access solution can help visually impaired students regain their independence by using tablets to view an interactive whiteboard or similar learning materials remotely. This way, they can enlarge teachers’ notes and take screenshots to view at their leisure after class, or while doing their homework. By not singling out SEND students from the rest of the class, and by allowing them to access material at their own pace, they are able to regain confidence, and their parents are given much-needed peace of mind. Teachers also benefit by saving valuable lesson-planning time, and by not having to compromise lesson quality for the whole class. A similar arrangement can also benefit students with dyslexia and other learning difficulties, who often need extra time to read lesson materials, and whose pace might not match that of the rest of the class. Pupils with conditions such as autism or anxiety, meanwhile, can find the classroom quite stressful with its bright lights, loud noise, and other distractions. Connecting remotely can allow them to view lesson materials in a less overwhelming environment better suited to their needs. Being able to interact with teachers through a remotely connected device can also be helpful to kids who have difficulty communicating, and who would find it easier to participate in lessons through an app on a tablet. For school-aged kids who are not as mobile, or who can’t attend classes due to debilitating conditions like chronic fatigue, remote access can provide a means of accessing lessons and educational resources from their home, or their hospital beds. This way, they could even sit their exams remotely and enjoy the same educational opportunities as other students their age. Connecting remotely allows pupils with disabilities to participate in lessons on an equal footing with their peers, enabling them to fully develop their independence, self-sufficiency, and academic knowledge. Beyond education, remote access also has a role to play in supporting people with disabilities in the workplace. 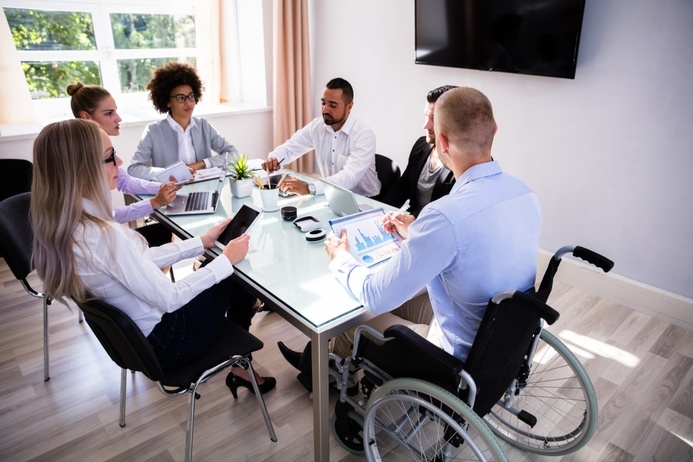 For those with a lifelong disability, entering the workplace for the first time must seem a daunting experience, and they may well wonder how they’ll cope. Equally, if you were a previously healthy person experiencing illness or disability later in life you might, understandably, be concerned about how it could affect your current or future employment. When it comes to seeking and maintaining employment, adults with disabilities or chronic conditions may feel like they are presented with an insurmountable barrier that adds to the usual challenges of working life. People who are not fully mobile or unable to commute to a traditional office may fear that the incompatibility of their condition with office life could result in long periods of unemployment and financial instability. Remote access offers the flexibility to work in a way which suits both employee and employers. For example, you can use the technology to access office resources and work from home. The ability to participate in the life of the office, attend virtual meetings with colleagues, collaborate on projects together and even take training courses remotely could significantly ease the feeling of isolation experienced by home-bound workers. More importantly, flexible and remote working policies enabled by this technology allow home-bound and disabled workers the opportunity of being fully on top of managing their conditions. Connecting remotely with health professionals for consultations and advice, attending appointments at short notice, accessing rehabilitation services, and continuing education through networked resources can make a profound impact on day-to-day life and quality of self-care. The technology can also give the carers of people with disability or illness a chance to support their partner or relative without affecting, or even having to give up, their current job. Whatever the situation, the peace of mind that comes from knowing your job and career are safe despite your changed circumstances is invaluable. As a parting thought, remote access doesn’t just promise to help people with disabilities in an office-based environment— it can also allow them to be employed in many other sectors. For example, the technology can allow workers to monitor and even control industrial processes and equipment remotely. This expands the possible number of positions that can be filled by people with disabilities outside obvious traditional office-based roles. People with disabilities and chronic illnesses may well feel isolated and under-appreciated. Remote access can play an important role in their education, helping them join the workforce, reintegrate into society, and boost their self-esteem. These are just a few of the ways in which a professional remote access solution can support people with disabilities. Undoubtedly, organizations have thought of, and may have implemented, many more. If you are interested in knowing more about how remote access has helped some pupils with special needs regain their independence, you can read two very interesting case studies here and here.